Are you looking for a gel eyeliner which can give you an ease to achieve all the trendy eye-lining looks from short/long Wings to Dramatic??? Then join me in the venture to explore the latest launch of our favourite brand from Pakistan; Luscious Artistic Ink Gel Eyeliner. Did the Black Lady in "Midnight Ink" won me over with some black magic or no??? To Reveal the Mystery Read More!!! An ultra smooth gel eyeliner with a deep, inky intensity that sets quickly to a waterproof finish for 24 hour wear. Each shade comes with a FREE double-ended brush featuring a fine liner brush on one side and a soft liner brush on the other, to unleash the artist in you. Create a smoky effect or a sharp line for on-trend eyeliner looks. Apply by dipping the desired side of the brush into the gel, making sure the brush is coated evenly. 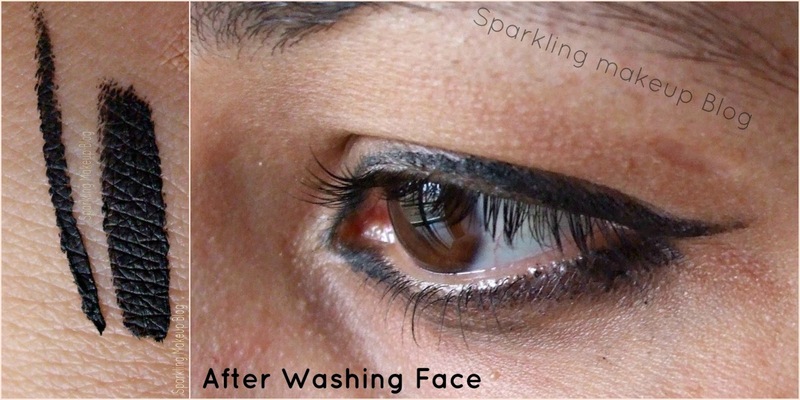 Apply in short quick strokes starting from the inner corner of the eye. Wipe the brush clean before storing. Available in four shades: I own "Midnight Ink". Luscious Artistic Ink Gel Eyeliner~"Midnight Ink"
I was won over in the "first-site", the packaging is so romantic, it seems that if I got a "Royal present". This one is a black box with a sliding compartment, sealed with round-tapes on both ends. All the required details are printed on the packaging. The inner compartment has the black-Lady with in a round cutting on a black shiny paper, the dual-ended brush is placed on the lower side. The Gel-Ink-pot is very elegant, its a round transparent glass pot with a sturdy plastic black screw-lock cap. 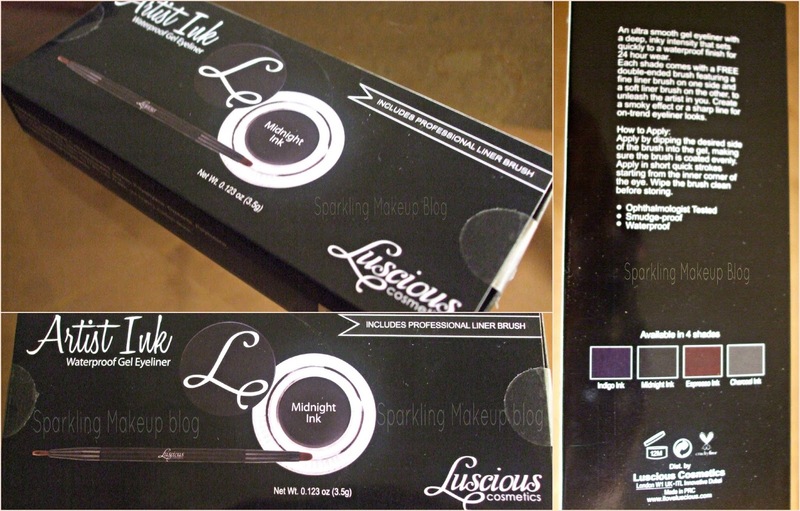 The cap has the signature "L" of Luscious cosmetics printed in white. The Brush is dual ended, on one side their is a sleek brush for fine-line and on the other side is the small round brush for smooth lining. The sight of this product is to die-for. I applied the gel eyeliner on both my upper and lower lash, washed my face with my daily use face wash, you can see its still there, only the liner on the lower lash line got smudged. I love the stay-put quality. Enough Proof of Water-proof. Note: I applied The Luscious Artistic Ink in "Midnight Ink" only on my upper lash line in all the looks below. Eye Makeup with Luscious Artistic Ink Gel Eyeliner~"Midnight Ink"
In Summers I only like to apply liner on my eyes with white or black kohl on my water-line, and for evening makeup I add on a little soft shimmer to my eye lids, that's it. No heavy makeup required to make a statement...that's ME!!! But to carry-off this simple statement one needs a powerful eyeliner. Luckily these days the Spring/Summer trend for 2013 allows us to have any look by the help of the eyeliner only, soft, dramatic, wings, smokey, Bold or Simple. 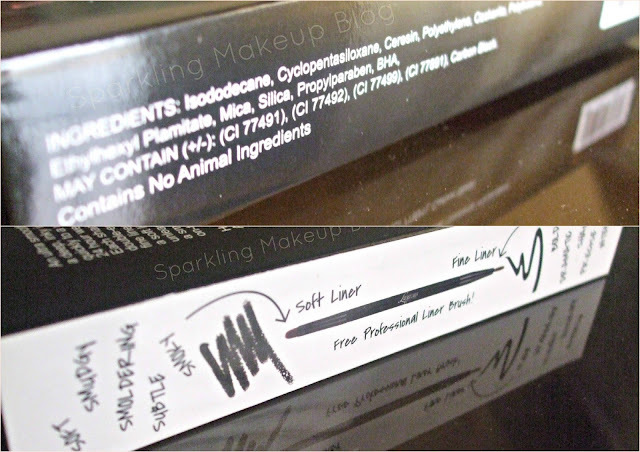 When I got Luscious Artistic Ink Gel Eyeliner in "Midnight Ink", which is the Black shade of the new launched range, I was not sure what to expect. But this Black Lady(I love to call it) impressed me beyond my expectations. First swatch and I was impressed by its pigmentation, texture and shade which is true Black. Then I applied it on my upper lash line with the fine line brush, I was impressed by the reasonable drying time of this gel liner neither super fast nor pretty lazy that you have to ask any one to blow-it-dry. For a pencil-eyeliner-freak like me a little practice is required but trust me its application is not that difficult to achieve along with the professional dual-ended brush. Soft-Liner brush for Soft, Smudgy, Smoldering, Subtle, Smoky looks (all with "S"). Fine-Liner brush for Bold, Dramatic, Sharp, Precise, Intense looks. I really love its stay-put quality. It proved to be REALLY Water-proof, even didn't smudge much after face wash. But that will make it a little difficult for removing for people like me, I guess it happens if we ask for WATER-PROOF. I love to wash-off the makeup with my gel cleansing foam, but this will not go away with that. Don't worry that will not stay there forever it can be easily removed with makeup or baby-wipes, I use the later, and can be cleansed away with any oil/cream based cleansing lotion. An Extra Effort required but what can't we do for the love of being-trendy :p The pot is pretty cool, its made of glass and I am really afraid of dropping it therefore every time I use it I place it far corner of my stand/shelf after dipping my brush in it. I heard that gel eyeliners dries pretty fast in the pot wasting the whole product, I have no idea about this one as it's pretty new in my stash, but I take extra care of it, I always cover it after dipping my brush in it, doesn't open it under fan. I think with these precautions taken it will not dry fast. The rest I will update if it ever does (hope it never dries-away in the pot). Above-all and over-all I am in love with this product and have my eyes on the other two shades of this range "Indigo Ink" and "Charcoal Ink". Used in a Makeup Looks Here & Here. 4.5/5. I am in love as I want to try all the trendy eyeliner looks with this beauty. The Luscious Artistic Ink Gel Eyeliner is for Pkr 895/- each. 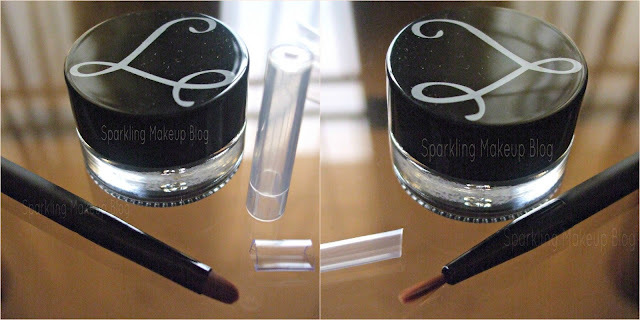 The Luscious Artistic Ink Gel Eyeliner can be bought from the cosmetics store having Luscious display counter, nationwide and you can also buy online from Luscious Cosmetics website. Join Luscious Cosmetics Facebook fan-page for latest updates. Hope you like this review and EOTD. Do share your views, comment, share, like, tweet, G+ and Pin IT. Do follow me on Blog Lovin now. 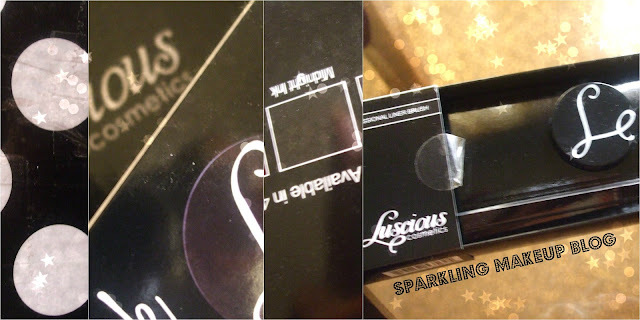 To read my other posts on Luscious cosmetics Click Here!!! Do you want me to post the details of EOTD along with the whole look and product details??? Bless me with your comments!!! Yes do!!! <3 You will love it for sure!